Our wines continue to collect awards in the international wine competitions. The Mundus Vini 2017 was attended by over 6000 wines from all producing area of the world that have been carefully evaluated by a jury of expert oenologists, Winemakers, specialized retailers, sommeliers and journalists. 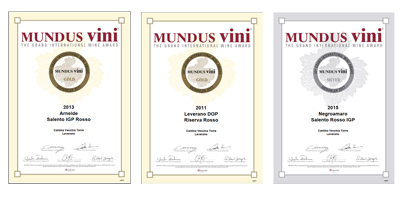 The strict competition rules restrict the awards to a maximum of 40% of competing products, obstacle brilliantly passed by our wines Arneide Salento Rosso IGP 2013 and Leverano DOP Riserva Rosso 2011 that obtained the Gold Medal, and the Negroamaro Salento Rosso IGP 2015 that received the Silver Medal .